When Standard-Triumph were developing the Herald range, to replace the ageing Standard 8 & 10, making a car with a separate chassis was unusual in the late 1950s/early 1960s. This was a matter of expediency for Standard-Triumph as they had no way of mass producing a monocoque body without Fisher & Ludlow, a previous supplier who had been taken over by competitor BMC. And using a separate chassis was actually quite a good idea when dirivatives of the basic saloon were envisaged (i.e. Estate or Convertible) as they could be produced without much additional expensive tooling. Interestingly a similar idea has been thought up by none other than Gordon Murray called iSTREAM, I quote: "Low-cost composite sandwich sections, called iPanels, are bonded to a combination of thin-walled, manipulated steel tubes called iFrame, collectively called iSTREAM, to form an incredibly stiff impact-resistant structure". "A major benefit of this is that cost effective flexibility enables a single production line to assemble diverse iSTREAM vehicle variants, without all of the associated prohibitive costs". (click here to see the iSTREAM website in a new tab). 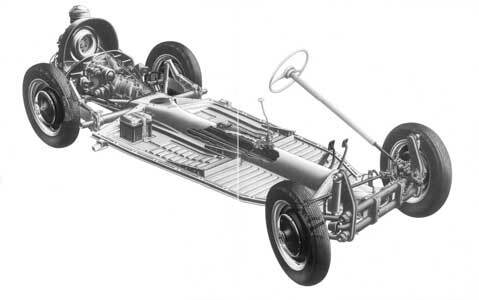 I will cover the Herald/Vitesse range chassis first, as this was the basis of the later Spifire/GT6 chassis. According to "Body Herald Range Vitesse Service Training Notes" (click here to see this in a new tab), "the design and construction of the Triumph Herald body is a combination of the conventional chassis construction and monoconstruction principles. The body consists of sub-assembles which are bolted together on a separate frame of advanced design, producing a light and rigid structure". 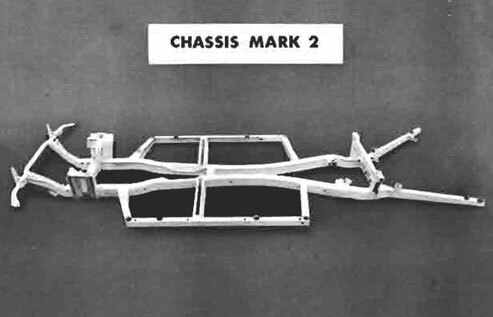 The illustration below comes from these notes, and shows the strengthened mark 2 chassis (the mark 1 was only used on early cars). The basic structure has what is known as a twin flanged box section backbone carrying the main torsional and bending loads, with light channel section side rails or outriggers, to stiffen the body. Note that the front suspension is mounted on Turrets or Towers (left of the picture below) which are bolted to the chassis. These are shared with the GT6. The raised structure at the rear (right of the picture below) is for mounting the rear suspension and differential. 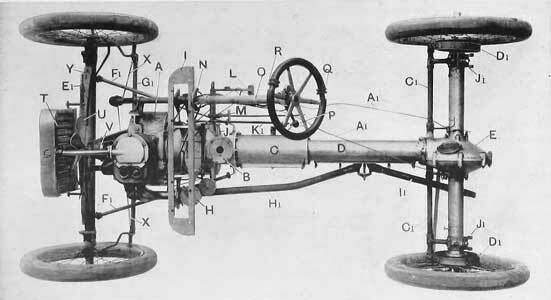 Backbone chassis were first used in the English Rover 8hp of 1904 (see below), allbeit in tubular form, with the propeller shaft in the middle of a central tube. 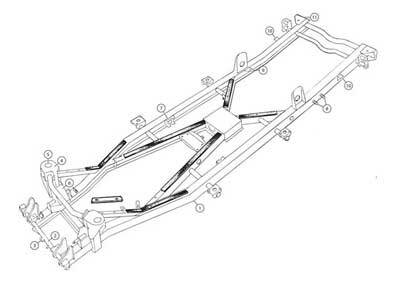 Various iterations were developed by the Austrian automobile designer Hans Ledwinka, et al, culminating in the VW Beetle "floorplan" chassis (see below). As far as I know Triumph's twin box section backbone is unique. 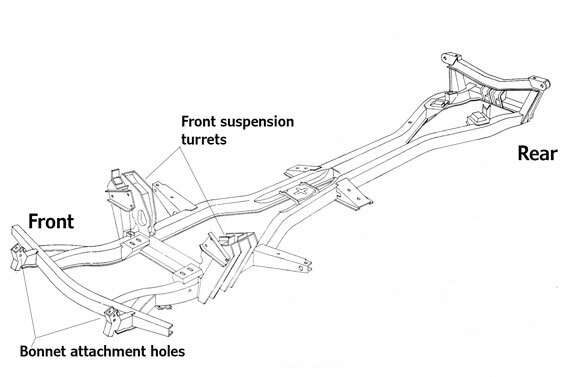 It can be considered a variation of the earlier TR chassis which used box sections, with the central section strengthened (see below). The first Spitfire prototypes ran on the modified Herald Coupé chassis, until Triumph built their own Spitfire chassis. One major effect of removing the outriggers was that the structural integrity was compromised, this was corrected by making the sill structure much stronger. The effect of this is that any corrosion in the sills is more serious as in the Herald/Vitesse as some of the strength of the body/chassis depends on the this structure.